Stone butts and red grouse on a wine colored Scottish moor. Mule drawn wagons following bobwhite seeking pointers beneath loblolly pines. Rolling hills filled with olive trees and red legged partridge. Undulating plains rhythmically swaying to the wing beats of sharptails. These are the images of exceptional upland locations that feature unmatched bird hunting. And had I not spent a decade working Safari Club International, I wouldn't even know where to start with booking a hunt. Most upland hunters wouldn't even know it was possible to travel to these amazing locales. The outfitters and guides who deliver these incredible experiences need to refresh their marketing to the latest generation of upland sportsmen and women. It's time for high quality outfitters to use social media to start exposing hunters to their destination. 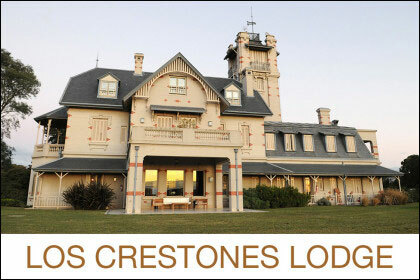 The lodge at Los Crestones operated by David Denies Wingshooting. A few companies and locations are succeeding in these endeavors. Bruno Roisch of Trophy Hunting Spain and David Denies Wingshooting are two entities that are really embracing the ability to cheaply reach a younger but affluent audience. And they are giving great exposure to Argentina and Spain. But Nicaragua, Paraguay, Bolivia, Southern and East Africa, Scotland, Italy, Eastern Europe, and Lapland, not to mention Idaho, Oregon, Montana, and Nova Scotia, are all destinations that need more younger hunters interested in experiencing both their excellent upland hunting and unique cultures. For my demographic, who has learned of exotic locations, and is starting to have a little extra disposable cash in our pocket, how are we supposed to book an outfitter who doesn't have a website, or check email or barely answers a cell phone. The young professionals I hunt with don't want to hop on a plane in order to fly to the Dallas Safari Club Convention or the SCI Convention, spend a week meeting outfitters, asking for references, and laying down some cash in a pay now or wait until next year scenario. My companions would much rather spend that week away from family and work actually hunting. They want to have easy, iPhone compatible services that search your species or location of interest, identifies outfitters in your price range and lets you pay at least your deposit directly. This probably doesn't sound all that intimidating to most readers of Shotgun Life. But to most outfitters it is a significant departure from standard operating procedure. Luckily a few entrepreneurs have tried to improve your hunt booking experience. Here in the U.S. Powderhook has created a highly interactive website and mobile platform that helps connect landowners/guides/outfitters with interested hunters. Additionally, Powderhook has a section wholly devoted to those committed to the DIY. It's an exceptionally well-executed website and is a massive step forward for the industry. 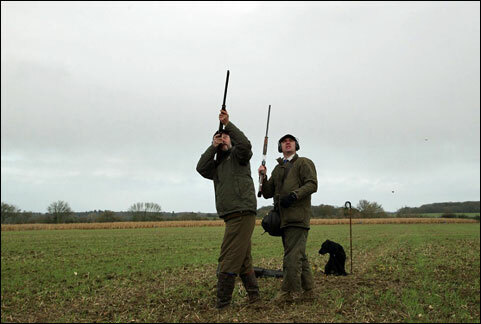 However, more outfitters and landowners need to become a part of their community to help spur the demand from hunters. Hunters at Little Hauge Hall available through the web site GunsOnPegs. Abroad there has been one very significant standout with regards to online booking of shooting. Guns on Pegs has been in operation since around 2009 and their singular goal has been to put hunters and outfitters in direct connection. Their site does a phenomenal job of searching, pricing, and detailing all the accommodations a shooter has to consider when booking an adventure. It is as close to one stop shopping as a hunter can get. But alas they service the U.K. and Europe. It's free to be a member of either website so take a few minutes to explore their website. You might just find your next dream hunt. Finally, what will guides and outfitters get for all their trouble expanding their marketing and booking strategies? They will get exposure, sales, and early loyalty from sportsmen and women who are young professionals. And as careers advance, expendable income increases. The commitment to upland hunting deepens. When an outfitters or guide has been seeking out an interested hunter to experience their lodge, their destination, their adventure, those outfitters will be creating a 20-30 year customer. 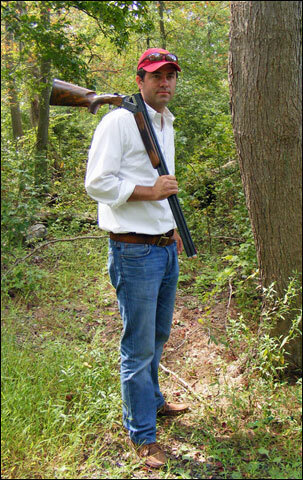 Nelson Freeman grew up hunting, fishing, and shooting in Virginia with his father, grandfather, and uncles. He spent eight years as a lobbyist and spokesperson for Safari Club International in Washington, D.C. Nelson is a Professional Member of the Boone & Crockett Club, a past board member of TreadLightly, and was recently appointed to the North Carolina Sportsmen's Caucus Advisory Council. He now lives in Raleigh, North Carolina with his wife and son.